Ghana, Mali, and Songhai were three of the greatest western African trading states. Beginning with Ghana as early as 300 c.e. and ending with the conquest of the Songhai by Morocco in the 16th century c.e., they dominated the trade of gold, salt, and merchandise between North Africa and sub-Saharan Africa. Arab scholars and merchants as far away as Baghdad marveled at the wealth of these African states. The geographer al-Ya’qubi claimed that “gold is found in the whole of this country.” But the trade of gold and salt was not the only basis for West African civilization. Remarkable cultural, intellectual, and cultural achievements made Timbuktu and other cities famed centers for the production of books in theology, history, and science, books whose weight was often valued more highly than gold. Ghana, Mali, and Songhai were successful and well-organized states that overcame tribal divisions and fused traditional beliefs with the universal ambitions of Islam. The internal strength of these West African empires was what made the gold trade so successful. An intricate system of silent trade, transport, safe passage for merchants, and control over a vast array of tribes and different geographical zones from the Sahara desert of modern Mauritania to the thick jungles south of the Niger River kept the lifeblood of trade flowing. When these empires declined, so too did the trade in gold. The historical sources for the empires of Ghana, Mali, and Songhai are written Arabic sources with a bias against non-Islamic beliefs, oral histories passed down by African griots or storytellers, and archaeology. Archaeological digs continue to reveal surprising secrets about the richness and strength of Ghana, Mali, and Songhai, sometimes confirming stories that were once dismissed as fantasy. Both written sources and oral traditions speak of the wealth and fame of the ancient kingdom of Wagadu. Arabic sources call the kingdom Ghana, a name that means “king” in the Soninke language. The vast kingdom included the modern-day countries of Mauritania, Senegal, and Mali. The climate of West Africa was dramatically different 1,000 years ago. 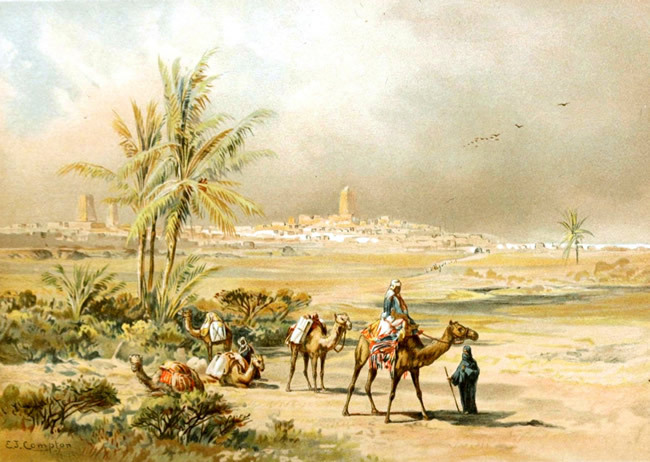 Archaeological evidence suggests that the parched climate of the Sahara drastically expanded south after 800–1050 c.e., when the empire of Ghana was at its height. The capital of Ghana, Kumbi-Saleh, once the wealthiest city in West Africa, is now a remote archaeological site in the middle of the Sahara. Climate change had a dramatic impact on West Africa as the center of power moved from near Ghana in the north, to Mali in the center, to the Songhai farther in the south. The kingdom was matrilineal, meaning that the king inherited the throne through the mother’s line; his sister’s son succeeded the king. Matrilineal inheritance and the powerful position of women were constant features of traditional Saharan society. According to Al-Bakri, the king of Ghana followed traditional African beliefs but respected Muslims who came to trade in his kingdom, often putting them under his personal protection. The Almoravids, Berber, Muslim nomads from the desert attacked Kumbi-Saleh in 1076 c.e. and weakened much of the empire of Ghana. Nevertheless, Ghana remained strong until it was annexed by Mali, an even wealthier and larger trading empire that formed south of Ghana. The empire of Mali was founded by Sundiata, a king who not only overcame external enemies but his own physical disabilities to construct an empire second only to the vast Mongol horde of Asia. According to legend, Sundiata’s brothers were massacred by Sumanguru, king of the Sosso people, rivals of the Mandinke, and the people of Mali. Sundiata, considered a harmless invalid who could not even walk, was spared. Accounts tell how he was treated as an animal and taunted by other children. He learned to walk on iron braces and became one of the strongest warriors and hunters. In 1230 c.e., some 18 years after the massacre of his brothers, the young Sundiata organized an army and overthrew Sumanguru of the Sosso at the village of Kirina in 1235 c.e. The dramatic Battle of Kirina is still recounted by griots as a struggle between two great magicians. Sundjata, the hero, seemed to have both the power of Allah and the traditional African nature gods on his side. After his victory Sundjata united the Mandinke chieftains and gained control over all the southern ends of the trans-Saharan trading routes. The successors of Sundjata, including a former palace slave named Sakura, expanded and consolidated the empire, conquering the cities of Timbuktu and Gao. A pilgrimage to Mecca was one of the Five, or Six, Pillars of Islam and necessary for all believers who could afford the journey. Mansa Musa, who reigned from 1312 to 1337 c.e., made the most famed royal pilgrimage to Mecca. Egyptian scholars give accounts of an enormous and extravagant royal caravan that visited Cairo on the way to Mecca. The chronicler Al-Maqrizi said that he paid so much gold in his purchases of fabrics, slaves, and provisions that he caused the value of gold currency in Cairo to drop dramatically. Mansa Musa not only returned to Mali from Mecca with greater devotion to Islam, but he brought several scholars and architects home with him, including the Andalusian architect al-Sahili, who helped transform the traditional architecture of Mali. Although he did not force the conversion of his people, he encouraged the growth of Islamic schools and developed a more methodical form of government using written Arabic. It could be argued that this tolerant fusion of West African and Muslim civilization made Mali one of the most advanced civilizations in the world. Using Eastern models, Mansa also established administrative and bureaucratic districts, keeping a close hold on his vast territories. The death of Mansa Musa (c. 1337 c.e.) led to a succession of kings unable to manage Mali’s enormous size. Berbers in the north threatened Timbuktu, while the Songhai people in the south began their rise as the last and most powerful of the West African empires: the kingdom of Songhai. The backbone of Songhai power was the mighty Niger River. As the empires of Ghana and Mali rose and fell, the Songhai fishermen slowly expanded from a region south of the great bend of the river Niger. The Songhai founded the bustling trading city of Gao just south of this bend in the 1300s c.e. Most of the Songhai became clients of the Mali empire until 1435 c.e. when two Songhai princes, sensing the decline of Mali’s fortunes, demanded independence. They established a new dynasty called the Sunni. Muslim chroniclers remember the Muslim Askia Muhammad Touré as the most famous king of the Songhai. Using the message of Islam to rally his followers, he expanded the borders of Songhai into the east of Africa, connecting his empire with the Indian Ocean trade that went as far as China. Mahmud al-Kati, who wrote a major history of the Songhai, claimed that Askia lived for some 125 years. Although that may be an exaggeration, Askia and the river people of the Niger created a strong and magnificent empire that was not seriously threatened until the invention of firearms. Firearms gave the Moroccan army a significant advantage when the Moroccan sultan Ahmed al-Mansur invaded the Songhai during the 1580s c.e. Half of the Moroccan army died of thirst and starvation as they crossed the Sahara. Still, the Songhai warriors were no match against the firepower of the Moroccans. Soon, Songhai, the last of the great trading empires, was in ruins.